Make the world finite. Give it measure. Since the beginning of time, humans have measured distance based on nature and everyday activities. 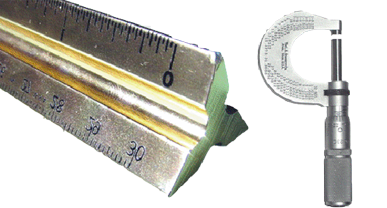 From their fields to the foundations of their buildings to the distance to the stars, there have been many kinds of length measuring tools: measuring tapes, rulers, human strides, even human hands! Perfect numbers for measurement from the beginning were ten (as in ten fingers and ten toes) and 6 and 12 (as in inches per foot). The Greeks tried to unify ways of measuring and established three standards: the Doric foot, Attic foot and Samian foot. A fathom was the distance from the fingertips of one hand to the fingertips of the other, while the arms were held straight out to the sides. A league was based on the distance that could be walked in an hour. England developed the yard during the 13th century. 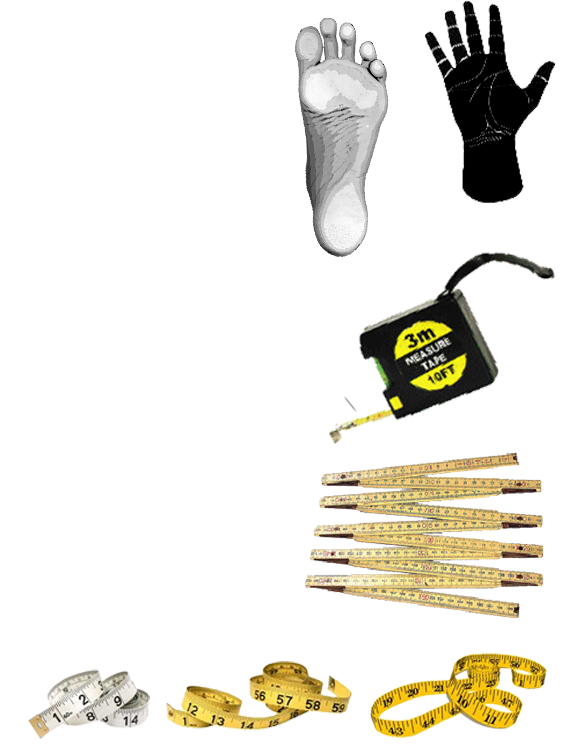 While parts of your body: your hands, feet and eyes can help you calculate distances, the measuring tape, ruler and laser are more accurate tools (See the Metric journey). France adopted the metric system or Système International d'Unités in 1837 based on millimeters, centimeters, meters and kilometers. The United States uses what is commonly referred to as the US Standard Units with inches, feet, yards and miles. Measure your world! Activity 1 – Rule the World! Answer "How tall, wide, or far is it?" Try looking at Universal Scale to get ideas for measuring the world! Draw a big x on a piece of pavement with a piece of chalk. Stand on the x and jump as far as you can. How many hands could you jump? Are your friend’s hands larger than yours? How does that change the results? Could you jump further or not as far? Keep a record of both your measurements and your friend’s measurements in your journal. Don’t forget to make a note of how large your hand is so others can see what your standard is. 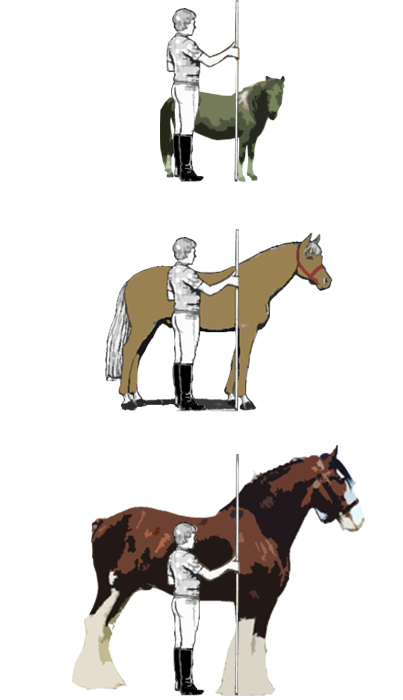 Even today, horses are measured as to how many hands tall they are! Go into your bedroom and sit down against one wall of the room. How far do you think it is? Guess the amount of space between the wall you are on and the wall across the room. Next, go into another room in your house and guess the length of that room. Build a chart in your journal listing your guesses of the dimensions of the rooms. Then, go into each room and take comfortable strides from one side of the room to the other. Each stride is approximately 3 feet. Calculate room dimensions based on your strides. Finally, get a tape measure and measure the width and length of each room. Complete your chart with your guess measurement, your stride measurement, and the actual measurement. 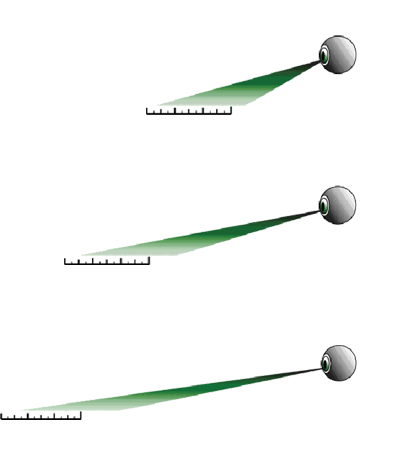 Compare your guesses and stride measures to the actual distances. Were you right? Were your guesses more accurate as you practiced and moved from room to room? Bring your new measuring skill to school and ‘measure’ your classroom. Compare your observations with your friends! Practicing helps! The measure “foot” came from an average length of a man’s foot. Your stride is the distance between your left and right foot when walking or running. You can shorten your stride by taking ‘baby steps’ or you can lengthen your stride by stepping further and further out. To measure your regular (comfortable) stride, mark a line on the sidewalk. Stand at that line and then take ten strides forward. Mark a line where your last foot ends. Measure that distance and multiply it by 12" to get the ten step distance in inches. Then divide the inches by 10 to get the average distance of each stride. You can use this to program a pedometer, or a tool that you wear on your waist that will measure how many steps you take or the distance covered. Pedometers detect motion of your hips and require that you calibrate or set the average distance of your strides before starting to use a pedometer. distance = number of steps × stride length Designers use strides to quickly estimate sizes of rooms, buildings and sites. They always follow up with accurate measuring devises before beginning to make designs! You can measure distance in the world. Using Google Maps type in your address and using the ruler measure your property. You can measure your block. You can measure your school campus! You can also look up directions between two locations. The map will suggest a route you can take and how long it will take to drive there! Perhaps we need a walking map! You can also measure long distances like the width of the United States or the height of China. People measure many things like time, age, height, width, length, temperature, weight, distance, speed, mass, force, etc. For each type of measurement there people have developed words to record the amount. 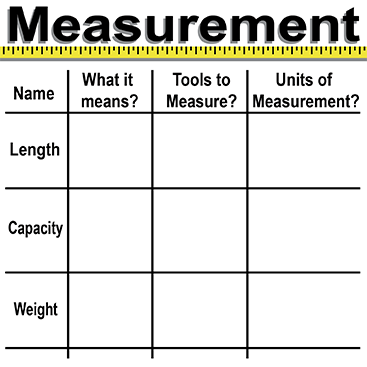 Fill out this chart of common measurements and terms to get started measuring! Temperature: physical quantity corresponding to the level of heat or cold, which is measured by means of a thermometer. Distance: the interval separating two points in space. Angle: figure formed by two intersecting lines or planes measured in degrees with 360 degrees being a full circle and 180 degrees being half of a circle. Who used The Doric foot, the Attic foot and the Samian foot? What measuring system did Napoleon use? Which country uses the Imperial System? What is the most accurate way to measure a room? Video Comet "Two Right Feet?"